Emily C. Friedman (email: ecf0004@auburn.edu) is an assistant professor of English at Auburn University. In addition to her articles on women writers of all kinds, with Devoney Looser she is the co-editor of a special issue of Romantic Circles Pedagogy on "Teaching Jane Austen." Her book project is Reading Smell in the Eighteenth-Century Novel. In the opening sentence of his review of Roy and Leslie Adkins’s Eavesdropping on Jane Austen’s England, Peter Lewis asks “Did Jane Austen smell?” This question, in Lewis’s mind, was rhetorical: of course Austen smelled! But it is understandable that Lewis would zero in on this issue as an opening to his review, given the contextual stenches of the book. “This was an era before antiperspirants,” the Adkinses write, “before the widespread use of soap, before a time when people washed their bodies and changed their clothing on a regular basis, and when virtually nobody immersed themselves in baths or showers. Everyone would have smelled, even genteel women like Jane Austen” (140). Roy and Leslie Adkins argued that the focus of their book is the “real” England of Austen’s day (xxiii). In service of this they repeat many commonplaces, particularly that perfume was used to mask smell of bodies more than to produce sweetness (140). While all strictly speaking true, these sorts of statements can be deeply frustrating to a historian of the senses. No doubt, the first thing a twenty-first century time traveler might notice about Austen’s England would be the smell. This trope is a feature of several of the time-traveling Austen novels: Courtney Stone awakens to the smells of “dried lavender mixed with ammonia” and “the ripe smell of unwashed body” in the very first page of Confessions of a Jane Austen Addict—indeed, discerning the source of the odor is her very first conscious concern (1-2). Her nose constantly is twinging with the smell of others, though she notes that “no one talks about dirt or smells in the novels” (88). But the verisimilitude only extends to bodies not directly involved in the romance plot: her hero, of course, is continually “freshly scrubbed, citrusy” (32) and “smells like soap and freshly washed linen” (124). In a similar way, the historical tourist Jane Hayes in Austenland feels relief and guilt to find modern plumbing in her room at Pembrook Park. While she is discomfited by the failure of “historical rigor” (35) and lack of the “bad smells” she associates with reality (153), what she wishes to encounter are precisely the differences that no “true” eighteenth-century person would notice. Jane latches onto the “historic smell” of “furniture wax and kerosene” though both are still ahistorical replicas, as kerosene was not used for lighting until decades after Austen’s death. Jane Hayes’s wish for a more “authentic” smelling Pembrook Park is a desire destined to be unsatisfied: even if the smells were completely authentic, she would still be smelling with a twenty-first-century nose. Our noses are designed to detect novelty in our environment and to filter out what is common. In the course of her lifetime, Jane Hayes’s nose has been trained to ignore low levels of car exhaust, the sometimes peculiar smell of air-conditioning, cleaning products, and other smells of modern life, while being startled by smells Jane Austen might have taken for granted: those of horses, candles, fires, and the like. What these twenty-first century Austen-mad heroines show us, sometimes intentionally and sometimes not, is how we might react to Austen’s world, not how Austen’s characters or her early readers would have. In order to recover that experience—insofar as it is possible—we have to look at the evidence that Austen provides us within her novels. Perception of scent is profoundly personal and shaped greatly by our memories, as well as our cultural and historical position. Even today, depending on one’s age and home country, “clean” may mean a certain kind of vinegar, pine, citrus, violets, orange blossom, or something else entirely. And as Virginia Smith has shown us in her sweeping history of cleanliness, standards of cleanliness and how people achieved them do not result in an unending march of progressively “cleaner” people but a moving target across cultures. Because of the variability of notions of cleanliness and scentedness, scent is both an essential and seemingly impossible-to-recover aspect of material culture. Scent is one of our strongest ties to memory, yet for most people to remember a smell without external stimuli is almost impossible. Moreover, as some sense critics have argued, the ability of human beings (specifically Western humans) to smell has been diminished through a process of increased emphasis on odor-removal, hygienic practices, particularly bathing, that emphasize de-odorization (rather than the covering of one odor by another). Often this turning point is placed at the beginning of the nineteenth century, precisely at the time that Austen was writing. While other intangibles of the human experience have been placed into the context of the early novel, scent has so far remained largely sidelined in favor of discussions of the visual (including illustrations, book history, landscape, and material culture, among others), the aural (reading practices that include reading aloud to a group and other performative dimensions within novels themselves), and even issues of taste. Like performance studies, sense studies seek to recover, reconstruct, and ultimately critique an experience that, even if reconstructed precisely, has lost its connection. Fanny Price’s sensitivity to the world around her has been discussed in many ways, but less attention has been paid to the two olfactory worlds she moves between or to the cultural norms attached to her acts of smell-perception and to the varying levels of scent-acuteness in other characters in the novel. Thus, to provide a better context for the olfactory worlds of Mansfield Park, in this essay I will discuss Austen’s known writing on smell and smelly objects and people. In addition to the shocking smell of Fanny’s Portsmouth homecoming, I want to draw particular attention to the preferred scented objects of the elder ladies of Mansfield Park: the vinaigrette, or smelling-bottle. Tiny bottles of pleasant (or pungent) scent or salts, these objects appear extensively in women’s fiction of the long eighteenth-century. In order to further contextualize the often-fleeting references that occur within novels, I examine a variety of such bottles and vinaigrettes from the period and discuss their use and abuse. In this way, we discover yet again that Fanny is stronger than we knew. To be fair, Austen does make reference to dirt and the war on dirt: coaches, hired rooms, and the like could be found to be tidy or dirty. Austen makes arrangements to send her clothing to Cassandra (12 October 1815, 24 November 1815) before balking at the expense (2 December 1815) or out to washerwomen. She finds “taking quantities of snuff” the only thing to dislike in a new acquaintance (25 April 1811). Austen, as we know, was aware of the level of cleanliness or lack thereof in her immediate surroundings. Austen’s letters decry lodgings as dirty (14 September 1804) and report the cleaning and making-ready of the house in Southhampton, among other domestic notables. As with many of her other incisive remarks on the people around her, those responsible for the care and upkeep of her home did not escape her sharp eye. Consider one of Austen’s most infamous letters to Cassandra, where she reports that “Mrs Hall of Sherbourn was brought to bed yesterday of a dead child, some weeks before she expected, oweing to a fright.—I suppose she happened unawares to look at her husband.” (27 October 1798). Poor Mrs. Hall, and her frightfully ugly husband, are not the only ones flayed by Austen’s pen on that sheet. In the same letter she reports that she has eyed “John Steevens’ wife,” who will replace Dame Bushnell as the washerwoman, and declares, “She does not look as if anything she touched would ever be clean, but who knows?” While Austen “detect[s] dirt in the Water-decanter as fast as I can,” she can also delight in a competent servant: James, she writes, is “the delight of our lives; he is quite an uncle Toby’s annuity to us.—My Mother’s shoes were never so well blacked before, & our plate never looked so clean” (14 September 1804). Some of these examples are far removed from our own time, when laundering and dishwashing are now not art forms but tasks performed by complex automated machines. But in some cases, Austen’s concern with dirt seems to be as current today as in the eighteenth-century. A house may “have all the comforts of little Children, dirt & litter” in any century (11 February 1801), and I doubt there is anyone who has experienced a home or office renovation who cannot sympathize with the feeling that one’s surroundings are “all dirt & confusion, but in a very promising way” (20 May 1813). Still generally unpaved, country walks along footpaths have not ceased to be dirty since Austen’s time. Austen’s use of scent can be fruitfully compared her treatment of food, which as Maggie Lane has noted, is also far richer in the correspondence and the juvenilia than in the novels (xiii). Those looking beyond the correspondence for Jane Austen at her most pungent—satirically, linguistically, and olfactorally—are best pointed towards her juvenilia. In a scrap of a “First Act of a Comedy” (1793), Chloe sings a song and then reads the bill of fare: “‘2 Ducks, a leg of beef, a stinking partridge, and a tart’” (Juvenilia 220), and in the epistolary Love and Freindship (1790), Laura laments: “‘Alas! . . . how am I to avoid those evils I shall never be exposed to? What probability is there of my ever tasting the Dissipations of London, the Luxuries of Bath, or the stinking Fish of Southampton? I who am doomed to waste my Days of Youth and Beauty in an humble Cottage in the Vale of Uske’” (105). While Bharat Tandon argues that Austen often puts the “luxuries of Bath” and “stinking fish” in close proximity (56), her published work navigates in a middle way between the “luxury” of the highest aristocracy and the “stench” of the laboring and servant classes. While it is not true that Austen’s published novels are wholly without scent cues, it is true that Austen fades in comparison to the most heavily scented (or stench-ridden) works of eighteenth-century fiction, like that of Swift’s Gulliver’s Travels or the work of Tobias Smollett. But, as Jill Heydt-Stevenson has shown us, this difference in intensity does not mean that Austen’s work ignores “the sensual world of things, of stuff, of commodities” (2). Like many other novelists of the period, Austen’s olfactive palette is primarily made up of smelling salts and atmosphere rather than feces and rotting food. But if we return to Austen’s fiction with new attention to the smells that do seem to be novel or unusual in her world, we can see that smell does help make meaning, particularly for Fanny Price. After Love and Freindship, Southhampton would not arise and “stink” again in Austen’s fiction, but the neighboring coastal town of Portsmouth, Fanny Price’s birthplace in Mansfield Park (1814), is arguably Austen’s most unpleasant olfactive space. Fanny’s disillusionment with her homecoming is marked by the closeness of the space and the emotional distances they contain. Her excitement gives way to anxiety when her brother William departs, and when he returns with their father, her “doubting feelings” transform to full disappointment, “sadly pained” as she is by her father’s bluff, superficial “language and his smell of spirits” (440). His personal, alcohol-laden smell is the only time Austen mentions body odor specifically in any of her published work. Instead of familial welcome and emotional closeness, Fanny instead finds she is “in the midst of closeness and noise,” not of togetherness and happy chaos; “confinement, bad air, bad smells, substituted for liberty, freshness, fragrance, and verdure” (500). She cannot eat with the “accompaniments of half-cleaned plates, and not half-cleaned knives and forks” (479). Even the sunshine brings “neither health nor gaiety” but only a “blaze of oppressive heat, in a cloud of moving dust,” highlighting the many petty sins of poor housekeeping: the “tea-board never thoroughly cleaned, the cups and saucers wiped in streaks, the milk a mixture of motes floating in thin blue, and the bread and butter growing every minute more greasy than even Rebecca’s hands had first produced it” (508). Fanny, who has fled Mansfield to avoid the oppression of a man she does not wish to marry, is instead trapped in a home that is no longer home. She laments missing the springtime flowers and the “glory” of her uncle’s woods (500). Austen’s narrator emphasizes that this contrast, this loss of seemingly superficial “pleasures,” was in fact “no trifle” (500). As we have seen from Austen’s own correspondence, Fanny’s author was also sensitively aware of the cleanliness or dirtiness of her surroundings. Thus the parallel construction of “confinement” in “closeness and noise” and “bad smells” in contrast to the “liberty” of “freshness, fragrance, and verdure” seems one close to Austen’s heart as well as illustrative of Fanny’s own perspective. And for readers, this moment of shocking stench in Portsmouth is all the more surprising because the rest of the novel has not prepared us for this sort of olfactory barrage. Fanny Price the elder’s mésalliance does not dwell in particularities but instead is communicated to the reader with a rapidity of time and an emphasis on the distance and separation that her marriage has created. The elder Fanny, after all, secures a home for her eldest daughter through a “not unproductive” letter rather than through interpersonal contact between the two families. The closest Austen gets in the first chapter of the novel to revealing the stenches of their Portsmouth home is her mother’s second letter, which hoped that little Fanny might be “materially better for change of air”―to which our narrator adds, “Poor woman! She probably thought change of air might agree with many of her children” (12). Thus, when grown-up Fanny Price returns to her mother and family in Portsmouth, readers share in Fanny’s disorientation. Portsmouth and the Price family in residence have up to this point have been stripped of their embodied particularity, and when those details arrive in the narrative, they are repulsive rather than nostalgic. Scent, which triggers memory and stimulates appetite, fails spectacularly to accomplish either. Instead, the scents here are new and unfamiliar, part of what put Fanny in “the most promising way of being starved, both mind and body” (479) during her time there. Fanny has either forgotten her childhood home in her assimilation of the refinements of Mansfield Park, or conditions for the ever-increasing Price family have worsened in the years since. Either option is a painful distance between Fanny’s idealized distant family and their all-too-close reality. It is all the more to the credit of Fanny’s moral compass that, when given the choice between the physical discomforts and disgusts of Portsmouth and the moral disgusts of the Crawfords, Fanny is only temporarily swayed. Portsmouth is the most viscerally pungent of the spaces of Mansfield Park, but smell also plays a role among the Bertrams. Mansfield Park, “modern, airy, and well situated” (517), protects its inhabitants from all sorts of stenches. The reek of food and labor is kept at bay not only by the architecture of the great house, which put kitchens at a great remove from the family’s life, but also by the tiny, personal scenting devices that appear at key moments in the text. These devices, often called smelling bottles, are among the most prevalent scents in eighteenth-century fiction. A later refinement of the pomanders used during the height of the plague era, smelling-bottles kept bad odors at bay for both aesthetic as well as medical purposes. For much of the century, smelling-bottles were generally vials filled with ammonia salts—the material that until very recently was used to revive concussed patients. Smelling-bottles could also contain fragrant waters, and near the end of the century, aromatic vinegars became popular either in vials or in cases that held small, soaked sponges. These containers became known as vinaigrettes. They are also one of the most prevalent scented objects in Austen’s fiction: Mrs. Jennings gives Marianne Dashwood salts in Sense and Sensibility (269); Anne Elliot supplies them in Persuasion (118); Catherine Morland rubs Eleanor Tilney’s temples with lavender-water just before Eleanor delivers the horrible news that Catherine is to be unceremoniously sent home (Northanger Abbey 230). Henry Tilney jokes that the ballroom is a space of gendered role reversal, where men must strive to please and women must support by providing “‘the fan and the lavender water’” (75). Tilney’s joke emphasizes the smelling bottle’s function as a tool of relief. As seen in the above examples from across Austen’s fiction, salts or smelling-bottles bestowed on another can signal to a reader the severity of physical or mental distress as well as the kindness and competence of those who provide the aid. At the same time, smelling bottles were also vulnerable to abuse: when filled with ammonia salts in particular, bottles could be weaponized (ammonia is deeply unpleasant to accidentally inhale) or merely overused by their owners. As visual props, they could be brandished to claim a depth of emotion not truly felt by the wielders. 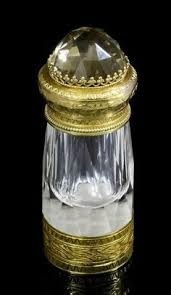 In Mansfield Park the most ostentatious keeper of the smelling bottle is Lady Bertram. When her daughter Maria is married, Austen places Lady Bertram “with salts in her hand, expecting to be agitated” beside Mrs. Norris, who “tried to cry” (237). The Bertrams and their retainers can manage the external niceties well: Sir Thomas gives his daughter away without fuss, the bridesmaids are “duly inferior,” Dr. Grant “impressively” reads the service, leaving “nothing” that “could be objected to when it came under the discussion of the neighbourhood, except that the carriage which conveyed the bride and bridegroom and Julia from the church door to Sotherton was the same chaise which Mr. Rushworth had used for a twelvemonth before. In everything else the etiquette of the day might stand the strictest investigation” (237). While the outward signs and motions of etiquette are scrupulously fulfilled (save the notable year-old chaise), the emotional expectations of the day can only be gestured to, not truly lived: Lady Bertram clutches her smelling-bottle in her hand to anticipate an agitation that is either artificially stimulated or merely pantomimed. Lady Bertram’s use of the smelling bottle is thus placed in parallel to Mrs. Norris’s attempt (and failure) to cry. It is unlikely that the salts would have any effect on Lady Bertram even if she did require them. The continual use implied by keeping them at the ready in one’s hand would not only desensitize the user to the effects of the salts but also render the user oblivious to any other smells around them. In unpleasant situations this desensitization would be a valuable feature of smelling-bottle use; in the context of the Rushworth wedding it seems to underscore how disconnected and oblivious Lady Bertram is to what is going on around her. Unlike her sister Lady Bertram, Mrs. Norris owns a bottle of revivifying aromatic vinegar but neither uses it nor has it properly available to aid those who might need it. When Fanny is pushed to her limit gathering roses in the hot sun for her aunts, no relief is available. Mrs. Norris loudly reminds those assembled that she never remembers to have her own bottle of aromatic vinegar filled—a small and fitting signposting of the way that Mrs. Norris continually puts others’ resources at her own disposal (85). We can detect a whiff of Austen’s irony in Fanny’s task here: she is hard at work gathering roses that were likely to be used either for drying into perfumed sachets or potpourri, or for distillation into precisely the sort of aromatic waters that might be added to smelling bottles to cut the bit of salts or vinegar. Moreover, an empty bottle or the lack of a bottle may signal in others a sign of practicality or robustness, but when coupled with the rest of Mrs. Norris’s moments of neglect, the absence seems to buttress readings of Mrs. Norris’s obliviousness and insensitivity. Austen’s use of smelling-bottles in Mansfield Park thus further underscores the emotional failures of those who ought to be the nurturers of the family group, who end up “benumbed” and unable to be comforted after Maria’s scandalous elopement (518-19). It is something of a critical commonplace to note that Fanny Price is physically weak though morally strong.1 But at the intersection of mind and body, where smelling bottles are called upon to revive both, Fanny never needs them. Unlike her aunts, Fanny does not require or display the prop of salts or vinegar. The closest she gets to needing olfactory support is when she gives “air to her geraniums” in order that “she might inhale a breeze of mental strength herself” (179), one of many moments of self-recovery in the novel. She revives of her own volition four times when emotionally overwhelmed by her family. Early on her deep “agitation and alarm” at the return of Sir Thomas make her relieved “to remain behind and gain a little breathing time” (206). Later on her nerves are stronger, and she is much quicker to recover in subsequent moments of surprise or intense emotion. The complications of Fanny’s sense perception and her moral perception reflect the enduring challenges of judgment and perception in Mansfield Park. Just as we need to shift our readerly perceptions and values in all sorts of large and subtle ways to appreciate the heroine Austen refers to as “My Fanny” (533), so too must we remember that our noses and Austen’s are not always the same. Recovering the smells Austen herself noticed and was sensitive to allows us to better understand when she deploys or elides them in her published fiction. As readers of Mansfield Park, recovering Austen’s subtle use of smell information not only reminds us of the weaknesses of Fanny’s aunts but also highlights the heroine’s perception and resilience. 1. Of the eleven times the word “weak” is used in the novel, only three refer to Fanny, two of those to Fanny’s self-perception and self-regulation. Twice “weak” refers to Mary Crawford’s character, once to Edmund’s perceived weakness, and once to Edmund’s self-assessed weak hopes. Similarly, Fanny is twice referred to as “delicate,” equal to the number of uses of the word in terms of Maria’s “delicate” situation in performing amateur theatricals while engaged. The ebb and flow of Fanny’s strength pulse through the novel. Adkins, Roy, and Leslie Adkins. Eavesdropping on Jane Austen’s England: How Our Ancestors Lived Two Centuries Ago. London: Rowan, 2013. Austen, Jane. The Cambridge Edition of the Works of Jane Austen. Gen. Ed. Janet Todd. Cambridge: Cambridge UP, 2005-08. _____. Jane Austen’s Letters. Ed. Deirdre Le Faye. New York: Oxford UP, 2011. Hale, Shannon. Austenland: A Novel. New York: Bloomsbury, 2008. Heydt-Stevenson, Jillian. Austen’s Unbecoming Conjunctions: Subversive Laughter, Embodied History. New York: Palgrave, 2005. Lane, Maggie. Jane Austen and Food. London: Bloomsbury, 2003. Rigler, Laurie Viera. Confessions of a Jane Austen Addict. New York: Plume, 2008. Smith, Virginia. Clean: A History of Personal Hygiene and Purity. Oxford: Oxford UP, 2008. Tandon, Bharat. Jane Austen and the Morality of Conversation. London: Anthem, 2003.